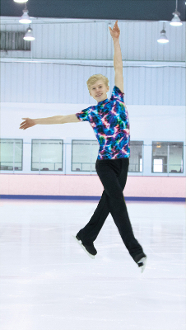 Jerrys 834 Mens Lightning Strikes Figure Skating Top. Easy going t-shirt style with multi coloured jolts of lightning and a subtle allover reflective sheen. Available in Youth Medium to Adult Large.